SPEED IS A SIGNIFICANT BENEFIT OF RAIL COMPARED TO OCEAN: The rail route from Southwest China to Poland is 15 days shorter. Euroconsol introduces new Silk Road Rail LCL/FCL service. New service connects to all major cities in China to Poland via transshipment. An eastbound Poland-to-Chengdu rail service will be available in September. Euroconsol, a neutral global NVOCC and freight consolidator, has announced a new, direct less than container load and full container load Silk Road import rail service from Chengdu, China, to Pruszkow, Poland. On-carriage is offered from the Pruszkow, Poland hub to Hamburg and Rotterdam, a two-day transit. Additional on-forwarding will be offered to Praha, Vienna, Helsinki, and Budapest in the near future. 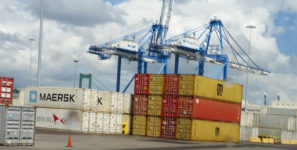 The service connects to all major cities in China via transshipment. An eastbound Poland-to-Chengdu service will be available in September from Euroconsol. A significant benefit of rail compared to ocean transport is speed. The rail route from Southwest China to Poland is 15 days shorter. The service is in collaboration with iCargo Alliance and Eurasia International Group. Chengdu International Railway Service Co Ltd. manages the intercontinental rail network running between Asia and Europe. Founded in 2012, the iCargo Alliance is a global NVOCC network of top brands in their respective countries. It was founded by C P World Group and Fan Cheng International Transportation Services Co, Ltd.
Euroconsol provides its customers, primarily freight forwarders, with comprehensive global import and export logistics solutions to and from Poland. Euroconsol leads in the areas of transport, forwarding, and logistics in Poland with regards to distribution of less-than-container load shipments from Asia to Central Europe through the Gdynia port and most cities of Central and Eastern Europe. Euroconsol also offers trucking services for domestic and international road shipments, both full truckload and less-than-full truckload to and from Poland and Germany to France, Belgium, Holland, Italy, Spain, Czech Republic and the Baltic states. Euroconsol’s team Polish, English, French, Spanish, and Russian.